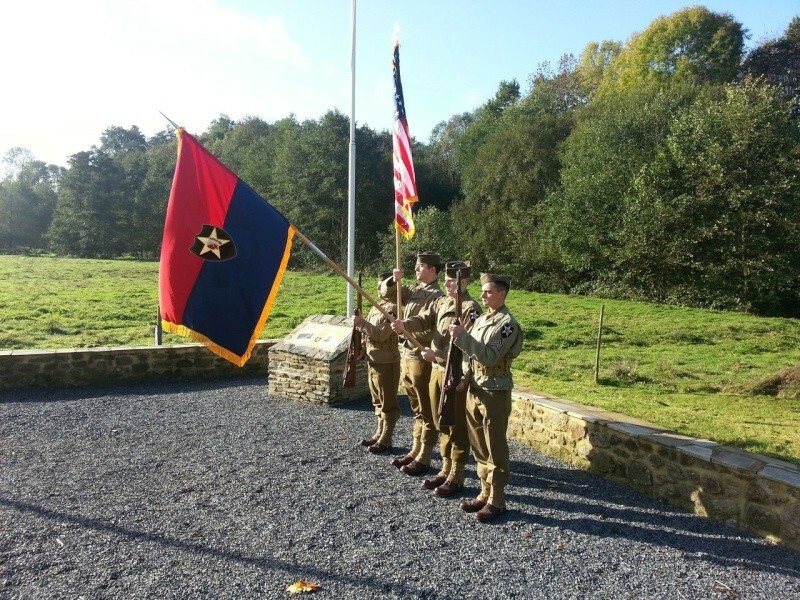 Recently a recce team from the First Allied Airborne Association travelled to France to carry out a recce to prepare for the groups deployment to Normandy in June 2014. With the 70th Anniversary of the landings looming the group had discussed returning to Normandy in 2014 to take part in the invasion commemorations and celebrations, however until being contacted by the organiser of a special event taking place during the second week of June, nothing had been confirmed or set in stone, however out of the blue it seemed, this Command Post received the following mail, I guess it explains in some detail what we were being asked to consider, so the mail is reproduced in full with the permission of the author. Please let me first introduce myself. My name is Geert Van den Bogaert and I work as a Battlefield guide in Normandy .Maybe you remember me as we have exchanged e-mails in the past. Maybe you also remember that a few years ago I created a small charitable association here called “Moulin des Rondelles 1944”. The foundations of this association were laid in September of 2007 when our I met Mrs. Carolyn Green, daughter of Pfc. Theodore K. Mister, Co’C’, 38th Infantry Regiment, 2nd Infantry Division (see pdf attached). She came to visit her father's grave at the Normandy American Cemetery. Mrs. Green knew very little about her father and was interested in anything that could be find out about his time in the service. This led to the start of research to find out what had happened to Theodore Mister. The citation for his Distinguished Service Cross indicated that the action that lead to his medal occurred at a place called Moulin des Rondelles in the village of Cerisy-la-Fôret, After obtaining the Company Morning Reports it was discovered that there were 9 other men from C Company who were killed during the battle and 23 others were wounded. In the meantime Mrs. Green and her husband Hank had informed me they wanted to return to Normandy in 2009. With the help of Mrs Jocelyne Le Trouit (the mayor of Cerisy-la-Forêt) and Mr. Steven Marsh, the owner of the Moulin des Rondelles (the name of an old mill located on the battlefield) , it was decided to erect a memorial to Theodore Mister and his comrades in arms. Attached you will find a pdf document of the monument. Mrs Green officially inaugurated the monument in September of 2009. At the same time I went looking for the families of the other 10 Americans who were killed at the Moulin des Rondelles (a 10th victim was found in 2011. He had died of wounds on 17 June). Nearly two years later I finally found all of them. A trip to the United States to meet these families in September 2011 proved extremely successful and several of the families expressed their wish to be in Normandy for the 70th anniversary of the battle. This then is the background to Moulin des Rondelles 1944. The association itself was set up to help achive our main goal, which is to welcome all of the family members of the 11 heroes of the battle of the Moulin des Rondelles to Normandy. We would like to ensure that they realize we have not forgotten their loved ones’ sacrifices. What better way to do so than to invite and welcome them at our Moulin des Rondelles ceremony on 13 June? What better time than 2014, the 70th anniversary of the battle, to do so? Many of the families have expressed the wish of travelling to Normandy and to be there for that occasion. The idea would be to welcome them for one week (8 June-15 June), accommodate, wine and dine them and take them on several field trips discovering the history, culture and gastronomy of Normandy and of course organize an unforgettable ceremony at the Moulin des Rondelles. Now the reason for this e-mail. As part of the ceremonies, we thought it would be good to have some appropriate ambience, including suitably attired re-enactors. During discussions at our meetings, your group was the first to be mentioned, as you have an extremely professional attitude towards what you portray. 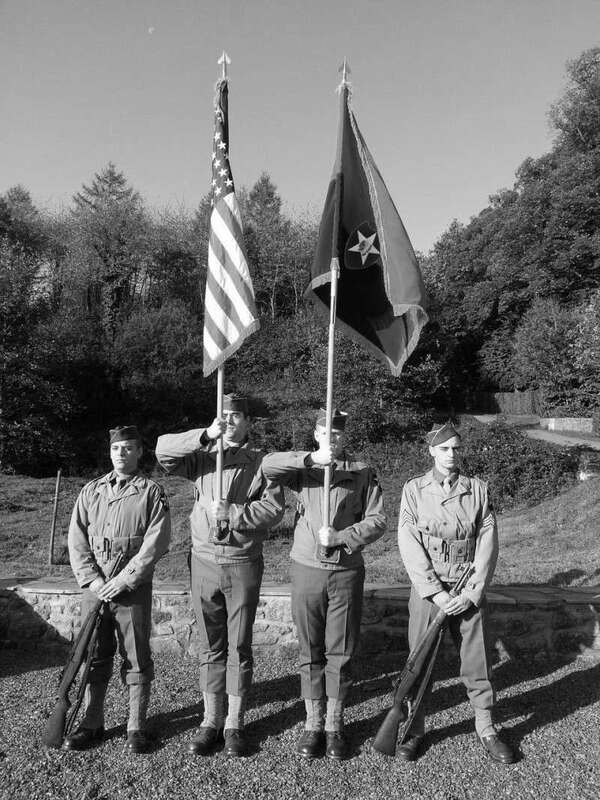 Would you and your group be able to assist with the Moulin des Rondelles commemorations in 2014, portraying men of C/38th Infantry Regiment, 2nd Infantry Division as an Honor Guard at the actual ceremony beside the monument. A living history set up near the battlefield that same weekend (14 and/or 15 June) could also be discussed. The ceremony in 2014 should be, we hope, the event of a lifetime for the families of those who gave all in 1944. Potentially the main problem, I guess, would be the date. If your group are attending ceremonies on the 5th, 6th and/or 7th, would you be able to stay a further week in Normandy, or be prepared for two trips over in quick succession? I have courtesy copied Mr. Sean Claxton to this message. Sean is an active member of Moulin des Rondelles 1944 and will be helping with the coordination of the ceremony. I sincerely hope you will be able to assist us, and look forward to hearing from you soon. Any thoughts or questions you might have, please ask. The above mail kind of focussed us on the tasks laying a head, of course we had to support this project and contact was established with Geert. After several mails back and forth it was decided without getting out on the ground it would be difficult to plan ahead, so the execs decided to get over there and meet up with not only Geert in regards to the 2nd Infantry Division project but also Irish Dave of the Ravenoville memorial fame, who we hoped may need some support from us. However if we were to support both Dave in Ravenoville and Geert over towards St Lo, we had a long deployment of over 10 days to consider. We decided on a long weekend in October, the team going out was 5 members of the group’s executive team, more than enough to make the short trip economical, so the Euro tunnel was booked and we counted down the days before the team went behind the lines. A couple of weeks later and only a few weeks after our last public show the team met up at this CP, loaded up the HRV and were heading to Folkestone and the tunnel. It only seemed a short while ago that we were taking the “Submarine” to France on the Southern France adventure, but this trip was to be considerably shorter, but still a 260 mile journey from Calais to Utah Beach. We were back on land within no time and heading across Northern France close to the coast. Thankfully the tolls were not so many compared to the Southern France trip, we made good time, however even with only 260 miles to cover fatigue set in and we had to pull into a service area and get some sleep. After an hour or so, we were again mobile and heading towards Caen. Once in the area we headed to Pegasus Bridge, no trip to Normandy could be complete without at least one visit to the Bridge, be it a replica, and of course the site of the greatest feat of flying ever undertaken, the Glider landing site and Major Howards memorial. We spent around an hour at the site, this early in the morning little was open so we just took in the ambience of the location and recharged our batteries before the next leg of the trip, the coast road drive and Omaha Bridge. This is always a pleasant drive, always a lot to see, even at this early hour. With little traffic we made good time and arrived at Omaha about midmorning. We took in a few sites, stopping at the bunker dedicated to all the units who assaulted ashore on this beach on the morning of the 6th June. Here we bumped into a large tour group who were doing their battlefield tour in several period vehicles, including Jeeps, trucks and DUKW. We watched this rather impressive convoy set off, before mounting up and moving out ourselves, again taking the coast road this time towards UTAH Beach. We had arranged to meet up with Irish Dave at around midday to one o clock so this gave us time to spend an hour in the UTAH Beach Museum which we all enjoyed, this museum had eluded us on our 2012 trip due to lack of free time. At this time of year it was not so crowded and we had the time to chill out and have a good look around. Of course most of us had been there in past years; however a lot of work had taken place in recent years and the addition to the museum of the Aircraft hall was well worth the visit in any case. One of the highlights of the museum visit was seeing a copy of the Dietz painting “Silencing the Guns” hanging in the Airborne display, I am sure Dane did not believe us when it was explained that everyone in that picture was a member of the First Allied Airborne Association. Before long we were mobile again, this time just for the short journey up the road to Ravenoville and our RV with Dave at his home. We arrived at Dave’s to a warm welcome, within minutes Dave was going into great detail about his plans for the 2014 70th Anniversary event at Ravenoville and how he saw us getting involved. It was exciting stuff! After a drink we were outside reliving the time were there last and the memorial unveiling day. The memorial still looks impressive, more so now it was just his house and the Memorial tablets in the front Garden. We talked through what we could supply and our overall plans for the group’s trip. Dave’s enthusiasm is infectious and we were certainly going to go away looking forward to the groups return to Normandy in 2014. After a far too shorter visit we were again mobile towards St Lo, the route we used headed inland past many famous areas none of which we had the time to stop and view, however on route we swung by the Army Nurses Memorial which the group established in June 2012, seeing the memorial at the entrance to the farm and two Evac hospitals brought back some good memories of the work the FAAA did in 2012 to get this new memorial established. From the Army Nurses memorial we moved further east to take a very similar route that the 2nd Infantry Division had done nearly 70 years before. Before replicating their route we went through Ste Mare Eglise, a more famous place in Normandy you could not find. The town looked very peaceful when we drove through and all of us commented on how in June each year the town and historical battlefield is spoilt when the circus comes to town. Our Sat Nav directed us across country to pick up the route the 2nd Infantry used to march inland the days after the initial landings. Before long we were moving through Trevieres and then entered Cerisy-la-Fôret, however all seemed not quite right, we understood the battlefield was in an area of open ground surrounded by woodland, we were in a much larger town than we anticipated. We drove through the town, we knew we were in the right place, the main memorial to the 2nd Infantry Division was to our right, but where was the battlefield where C Company’s action took place! On June 9, at 12.00 Hours, the 9th and 38th Infantry Regimental Combat Teams launched the first divisional attack, without the benefit of their heavy weapons. The heavy weapons were rushed to the units as fast as they were unloaded at Omaha Beach. The attack of the 2 Regimental Combat Teams was made in the middle of the V Corps sector, without the support of their machine guns and mortars. Their initial objective was Trevieres, a key position if the Germans planned to hold along their present line. While the 38th Infantry Regiment attacked from the north and west, the 9th Infantry Regiment would outflank Trevieres by seizing Rubercy, to the southeast. One battalion of the 9th Infantry Regiment was near Rubercy by dark, out of contact with the 1st Division on its left. The 9th Infantry Regiment lost 10 killed and 80 wounded for the day's action. To the west of this advance, the 38th Infantry Regiment had made slow progress against Trevieres, where the Germans resisted stubbornly from well dug-in positions. Its 2nd Battalion, attacking from the north, was fighting into the village by nightfall of June 9. During the day, the 15th and 38th Field Artillery Battalions had been called on very heavily for supporting fires, mostly against Trevieres, and had used 3.652 rounds up to midnight. By June 10, the 2 Regimental Combat Teams had received much of its missing equipment and transportation, and the attack was renewed in greater strength. The advances east and west of Trevieres had left the Germans there in an untenable salient. After a heavy artillery concentration fired before 0700 Hours, the village was cleared out by 0845 Hours, and the 2 Regimental Combat Teams went forward with no opposition except from isolated snipers and an occasional machine gun holding a delaying position. The result was the most extensive advance of the operation. The 9th Infantry Regiment got through Cerisy Forest after skirmishes with German scout cars, and bivouacked southwest of Balleroy with losses for the day of six wounded. The 38th Infantry Regiment reached the village of Cerisy-la-Foret, and at 2100 Hours its 1st Battalion was pushing on with orders to seize Haute-Litee at the southwest corner of the woods. Possession of the area by U. S. forces denied the Germans commanding ground from which to mount a counterattack against the beachhead; furthermore, it lay athwart the best direct route between St-Lo and the German forces defending south of Bayeux. On the other side of town we moved along another country road and picked up a small sign on the right directing us to our billet (Gite) and Command Post for the weekend, we lucked in, as we followed this road we passed a large and spectacular Chateau on our right which we later found out to be the 2nd Infantry Divisions Command Post at the time Ike visited in early July. The chateau La Boulaye featured in some filming which recorded Ike and Bradly's visit, we were to go back there on the Saturday to have a nose around. 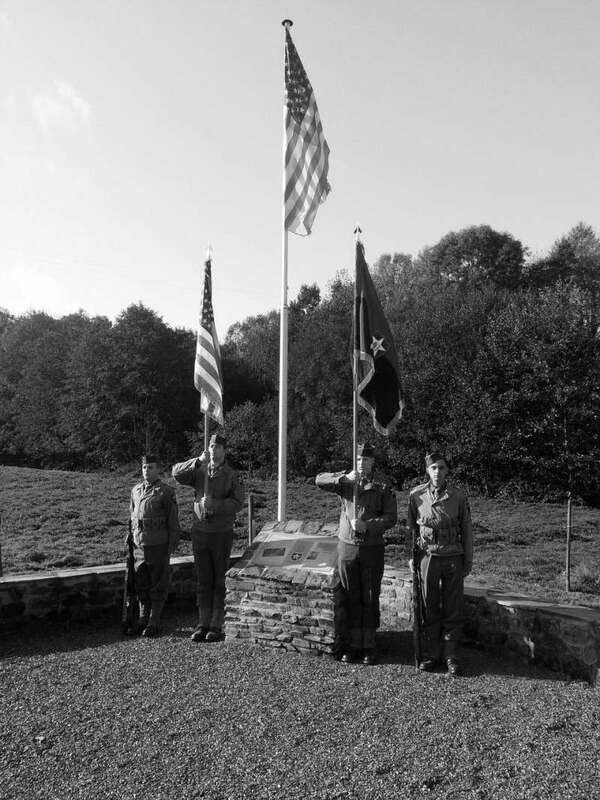 Further down the road we came to a large clearing with a single restored building overlooking several flag poles, one of which was flying the current flag of the United States of America, below which was a memorial, we had arrived. We pulled into the parking area and was met by Alain who was a friend of Geerts our contact in Normandy and also worked at the American Cemetery. His English was a bit better than our French, but it appeared that Alain was doing some work around the memorial site and it was Alain who had invited us to his house for dinner on the Saturday evening. Time was getting on and we had to book into our billet and find something to eat before meeting Geert back at the memorial site to go over the plans for the 2014 event. We had just enough time to get up the road to the Gite, book in, drop off our gear and grab a cup of tea before heading back out and down to the memorial site to meet Geert. Having corresponded for so long it was great to meet Geert for the first time and on the site of the battle he has taken such a passionate interest in. Geert had been for many years a battlefield tour guide and knew his stuff and had all of us spell bound with his narrative of the battle that took place in the fields in front of us. Many small unit actions took place in Normandy as they had done in countless campaigns before and after this battle, however we were here on the ground and what was described to us was both emotional and exciting at the same time. The thing that is most amazing was what happened in this valley and in the open field to our front involved a platoon level action and was ultimately led by a soldier of no more rank than Private First Class. Today a memorial marks the location of the Battle of the Moulin des Rondelles and honours the 11 valiant men from Company C who made the ultimate sacrifice here there on 13 June 1944. the land scape has changed very little, the river has been diverted somewhat, but the bridge is still there along with the old watermill. Again all too soon our first meeting came to an end, but we would again be meeting up the next day at the American Cemetery to pay our respects at the graves of some of those who lost there lives in this battle. With the sun setting we had enough time to take a group photo with Geert and then it was back up the road to our CP and an evening meal which our hosts had kindly laid on for us. With just enough time to scrub up, we were at the table with great food and fine wine in front of us. Afterwhich we chilled out in front of the open fire and chatted about our adventures that day, with a few more wines and one or two beers we spent some time putting the world to right before bedding down for the night, we had a long day ahead of us. After a good nights sleep we were up and dressed ready for chow. We had a full day ahead of us but had time to chill out over breakfast, after which it was gear up and head on out to the memorial site for planning and rehearsals. Breakfast over we continued to gear up, as an Airborne group primarily, putting leggings on is always a chore, but once squared away we mustered outside the Command Post in class B uniform to check weapons and the Honor Guards National and Divisional flags before mounting up in the HRV recce Vehicle and moving out to the valley and the Battle site. The Sun was out, it was a stunningly beautiful autumn morning, we could not have wished for better weather to rehearse the part we would play in the memorial service in June 2014. Once at the memorial we went through our passes, something we had done countless times in the past, but each time a little different, adapting to the layout of the parade area and what the organisers wanted. The Honor Guard has only recently welcomed a new member to the Color Guard and Dane spent some time with the more experienced members going over the basics before moving on to the group formation. We spent around an hour and half going over the parade format, well the bit we were to do and it all seemed to come together really well. It was very productive actually being able to do this on the very spot we would parade in June 2014, weather permitting this was certainly going to be something special for the Honor Guard and group, equally as special as when we paraded in 2012 at Ravenovile for Dave’s memorial unveiling and for our own Army Nurses (91st/128th Evac Hospital) memorial at Boutiville. The 38th Infantry Memorial Day will however be extra special in a year where the chosen conventional Infantry Impression we are doing is 2nd Infantry Division. Once happy with the rehearsals we loaded up the support vehicle and moved out towards Omaha and the American Cemetery where we were again to meet Geert who was to guide us around the memorial and burial grounds and show us where the only remaining 3 from the battle lay at rest. Their brothers in arms now lay in family plots in America, their remains retuning home shortly after the war in Europe was won. At each of the graves Geert had much to tell us about the individuals; it was very emotional putting stories and detail to each of the 3 soldier laying here in this cemetery. The stories made us even more determined to return to Normandy to complete this task. We spent some time at the Cemetery, but again it was time to move on, this time just up the road and the Overlord Museum, this very new museum is located a short distance from Omaha beach, on the D514 facing the roundabout that provides access to the American Cemetery at Colleville-sur-mer. The Overlord Museum chronicles the period of the Allied landing until the liberation of Paris. The collection was collected by someone who was both a witness to the conflict and involved in the reconstruction of Normandy. Personal items from individual soldiers and armored fighting vehicles from the six armies in Normandy is very well presented as a series of reconstructions and dioramas showing over 35 rare vehicles, tanks and guns. All of us in the recce team commented on the standard of the displays, one of the best museums in Normandy for sure, for those who have never seen it before it’s on the list of visits in June 2014. We stopped off a couple of times at other locations, but our last aim on the Saturday was to swing by one of the oldest museums in the American sector, the Omaha Beach museum at Saint-Laurent-sur-Mer, here we were meet up with Celine, Dave’s other half who works there and who we had missed on the Friday. One of the very first museums to be established in the area it is packed with some very rare gear, however it is in need of a major revamp to be able to compete with some of the more recent museums that have been opened in recent years, word is this may happen, however its always worth a visit and for us it was great to see "Frogett" and spend some time with her. Again it was soon time to move out and head back to the Command Post to get ready to meet up with Alain who was to guide us to his place where we were to meet up with Geert for dinner. We followed Alain at a rather fast pace, at times loosing him as he sped off at a great rate of knotts, I remembering commenting on the fact he did not look like a car driver, more a biker. 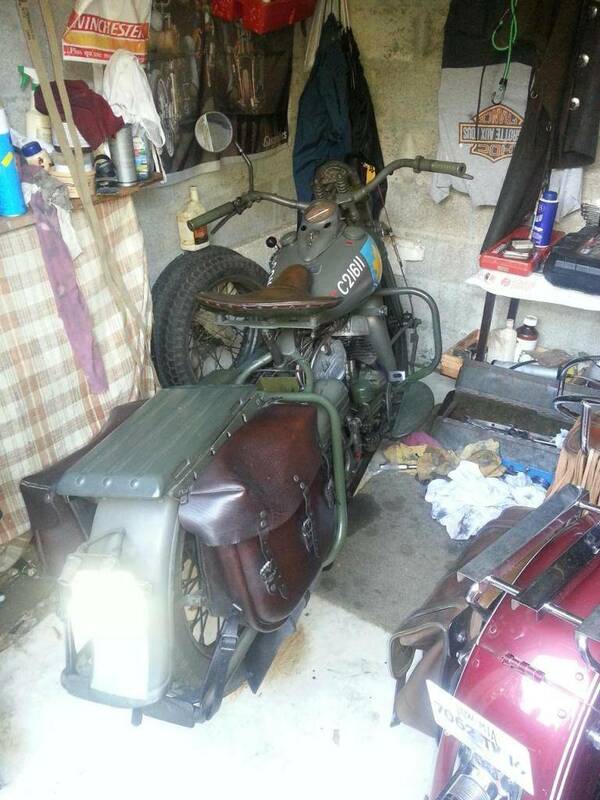 Well I was of course right, when we reached his place we saw several bikes, one modern Harley, a classic Indian and a WWII Harley Davidson. Bob would have been in his element! The evening was great, we had time to chat about the trip, sort some things out, make plans and socialise. Before we left to make our way back to the CP Alain presented us each with a small American Flag Marker, we were told that these were the very first flag markers to be placed on the graves when the Normandy American Cemetery in Colleville-sur-Mer was opened, an honor for sure to be presented these. After a good night’s sleep we were up at first light for an early breakfast, loaded up we said our goodbyes and we were mobile again, heading out towards the beaches before travelling north towards the tunnel. We left Normandy excited about the return in June 2014. Other than to commemorate the 70th Anniversary, we had a reason to be in Normandy a reason to be in Uniform and a reason to bear arms. All that was left to do now was to get numbers, coordinate the different phases of the deployment, liaise with other groups, go firm on our other commitments between Ravenoville and our 2nd Infantry taskings. Organise a timetable, book vehicles and troops onto ferries, obtain authorisation to transport weapons, collect funding from available troops, prepare Uniforms and equipment, service and repair vehicles ready for the trip and of course keep everyone happy, both within the group and over in Normandy. It was identified of course that the group is now smaller, so we would need all group members to commit and play their part, however with smaller numbers it was more manageable and still very workable, we had enough to cover the main tasks put before us, the Ravenoville and 2nd Infantry Color Guards and the Dropzone “Pathfinder security team. We would be deploying in two groupings, the main party with Military Vehicles and the follow on group consisting mainly of the Army Nurses section. The recce could not have taken place without the help of others and the FAAA recce team would like to thank Martin and Carolyn Fletcher the owner of “Quatre Vents” our command post during this operation, their warm welcome and home cooking made us feel as though we were home from home. Thank you also to Alain and Nathalie Dupain who entertained us on Saturday evening and welcomed us into their beautiful French home. As always it was wonderful to meet up again with Irish Dave and Celine true friend of the FAAA. Finally a big thank you to Geert and Steven for making the whole thing happen and for inviting us to take part in their project, all of us in the team are truly humbled. The FAAA has had a very busy year. I will post up some of the other major events we have done this year as reports are completed including the fantastic trip to Southern France. 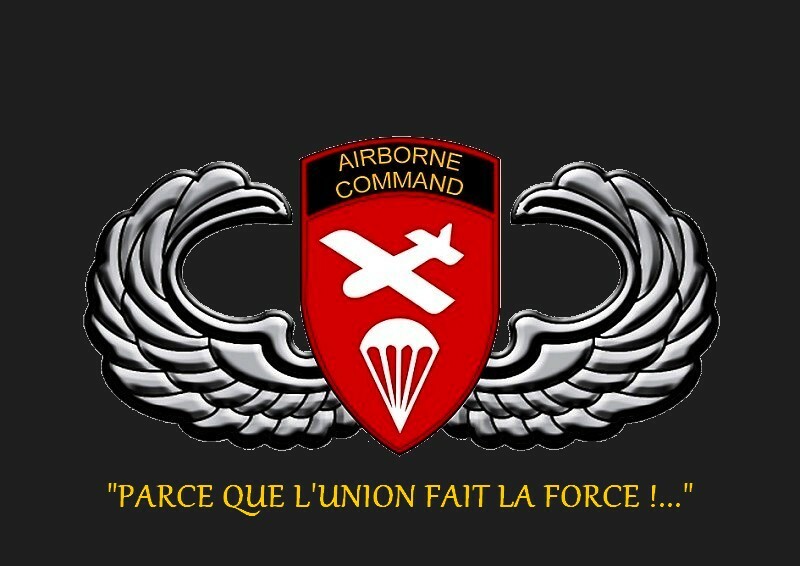 Regards to all our friends in Airborne Command.